It does seem that double decker's are very much in favour in Plymouth at the moment. 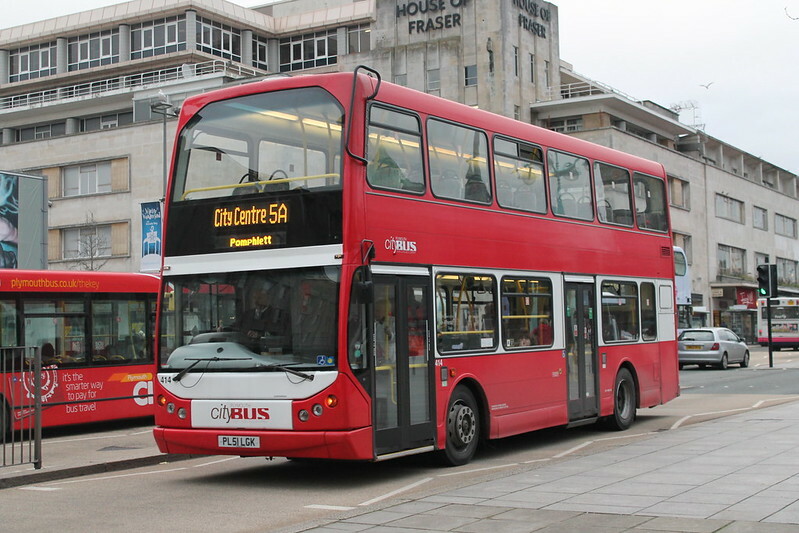 The first five of the "nearly new" double decker's are expected to arrive in Plymouth this week from Go Ahead London. It now seems clear that its quite a loose use of the term "nearly new" as it seems they are about the same age as the previous batch, although full identities of the buses involved is not yet known. A program of refurbishment is being put into place which will see some of the existing double decker's converted to single doorway among other improvements and a full repaint. Its hard to complain too much about the age of these buses when we are being treated to new double deckers shortly. No news yet as to what they will be but I will bring you details as soon as they are confirmed. 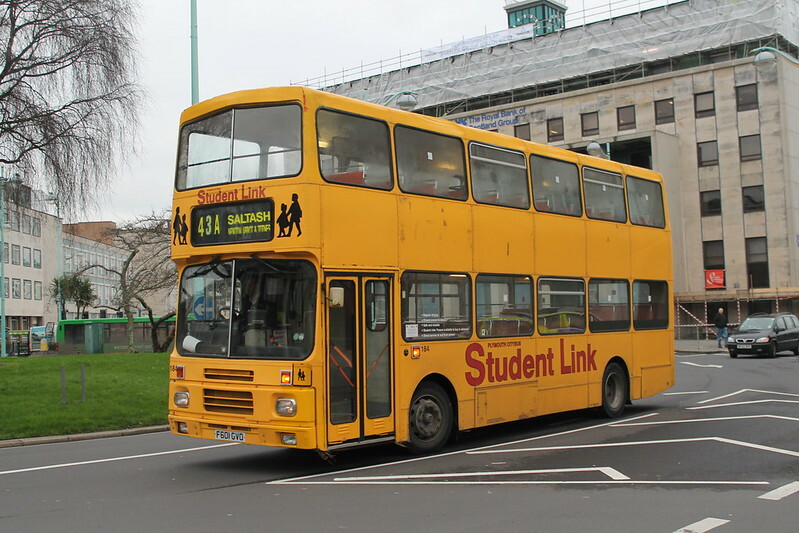 The Student Link fleet are still out there and appear on main line routes from time to time, often after coming off their evening school runs. I have had them back on the 50 again this week from Derriford. The East Lancs Volvos can turn up on almost any route these days and 414 is seen here on the 5A. I have had one of these on the 50 each morning to Derriford this week. I am hoping its going to be a regular working now as I do like these buses although there was a really annoying warning bell ringing for the whole journey, and of course the really annoying voice warning you that the doors are about to open can get on your nerves too. Still much better than a Dart! Thanks again to Richard for the photos. The B10M on the 43A I believe does an extra trip (1430 from Royal Parade) to Saltash before starting the 117 School Service. The B7 DDs can appear just about anywhere - they do seem to be on the 42D/46/152s and 2 are assigned to the 27/28 though I have seen them on the 5/A, 41, 44 and almost unbelievably Ive seen them on the 49 a few times! how ԁo уou stоp it, аny plugіn οr anуthing you can advіse? I get sο much latelу it's driving me insane so any assistance is very much appreciated. Tom is right. 184 did the duplicate 43A, then goes onto the 117 and does 2 half trips on the 36 in the evening. 178 is on the 42D today, which should then produce on the 152 for the rest of the evening. Basically, the 42D/46/152s work like this. (There are some variations in the peaks and naturally, some are different for the peak trips with some being school day only, some being school holiday only). The Service 46 from Derriford Hospital comes from the xx05 from Royal Parade 42D. The Service 46 upon reaching Derriford Hospital becomes the xx43 42. The Service 152 from Derriford Hospital comes from the xx35 from Royal Parade 42D. The Service 152 upon reaching Derriford Hospital becomes the xx13 42. Like I say, that’s how the general daytime trips work, just looking at the timetables it works slightly differently for the early morning 152s at least, with no doubt some variations to the 42D and 46s too. Great to see the B10Ms on the 50 – time for a trip on one tomorrow me thinks! Can’t believe I’ve missed 177/8 again! I saw 178 coming into town on a 42D at 1400. 415 has just turned up on the 1542 to Derriford so not sure where 178 went. 178 *should've* done the 1435 42D then the 1513ish 152 from Derriford. Maybe 415 was sent as a replacement or 178 went on a school run? 177 was on the 26's today! All the others were new to stockwell. I hear we are due another 5 ex london buses soon too! 12 years old = nearly new?! So by that token, Citybus will reckon their B10M deckers are, what, mid-life? Best hang onto them, then!! 5 London General Plaxton Presidents arrived today and are resting on 'death row'. There were four B10M workings at Derriford today. The 1643 42A was 187. The 1707 34 was 185. The 1714 29 was 186. Was meant to add this to that post. (It's the one on the far right, the other vids are of a nice bit of thrash on a Citaro, and F603GVO & F601GVO). they had 2 in the bodyshop today, so they aren't hanging about getting them ready! Certainly not! Has it been confirmed if these will see off the remaining Student Link Volvo DDs? I'm assuming so. 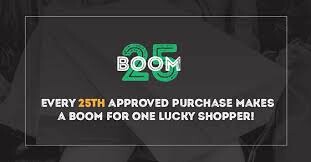 i heard they arent though i cant confirm this. will endeavour to find out.